ARLINGTON, VA. (April 23, 2018). Seven accomplished alumni of Yorktown High School were inducted in the school’s Hall of Fame and Inspiration at a ceremony set for Friday, May 18. The event welcomed inductees, their families, students, alumni, parents and community officials for whom presenters dedicated seven plaques containing photographs and biographies mounted on the wall in the gym lobby. The Hall of Fame and Inspiration was created in 2004 and includes such notable alumni as broadcaster Katie Couric (class of ’75), Google CEO Eric Schmidt (’72), Olympic swimmer Tom Dolan (’93), the late astronaut David Brown (’74) and Hilton Hotels CEO Chris Nassetta (’80). The addition of seven in 2018 brings the total inductees to 35, after rounds of inductions in 2004, 2008 and 2014. Funding for the project came from alumni donations. 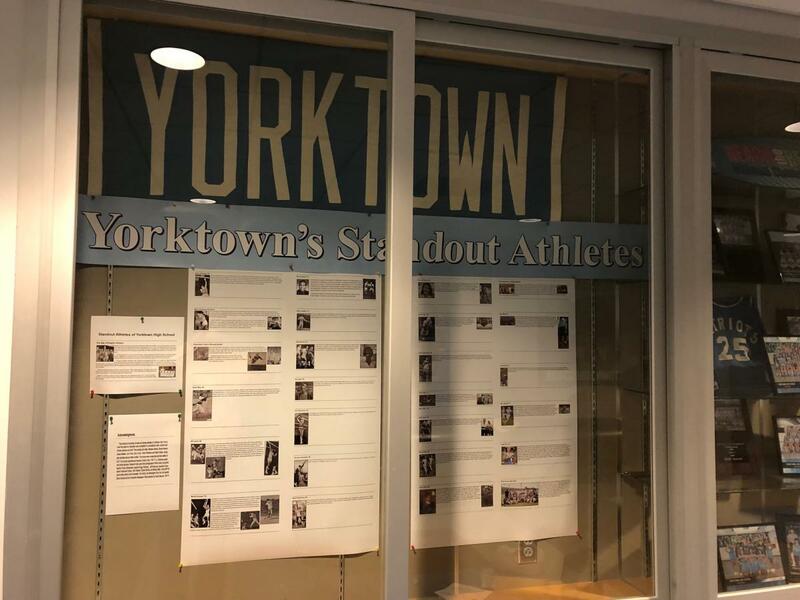 YORKTOWN'S STANDOUT ATHLETES, an online high school sports history round-up also on display in the Yorktown building, went live on the yorktownalums.org website March 29, 2018. Seven accomplished alumni of Yorktown High School will be inducted in the school’s Hall of Fame and Inspiration at a ceremony set for Friday, May 18. The event, scheduled for 7:00 p.m. in Patriot Hall, will welcome inductees, their families, students, alumni, parents and community officials for whom presenters will dedicate seven plaques containing photographs and biographies mounted on the wall in the gym lobby. An inductee can be an achiever in any field of endeavor that brings credit to the school. He or she can be famous nationally or locally, living or deceased, and should be inspiring to the high school-age students who will walk by their plaques every day.